Our family has been enjoying our little tree that sits proudly on our kitchen table. We recently used it to learn the fruits of the spirit. Since that time however, the tree has turned into our John 3:16 tree and we began as a family learning that verse. 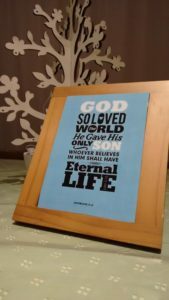 With the scripture beautifully placed on the table in a picture frame, my toddler each morning hung a picture on the tree to represent the major words in the verse. We also used a song (thanks to Jennie Flack) to help him remember it. It has been so fun watching him enjoy figuring out each word and proudly singing his song.